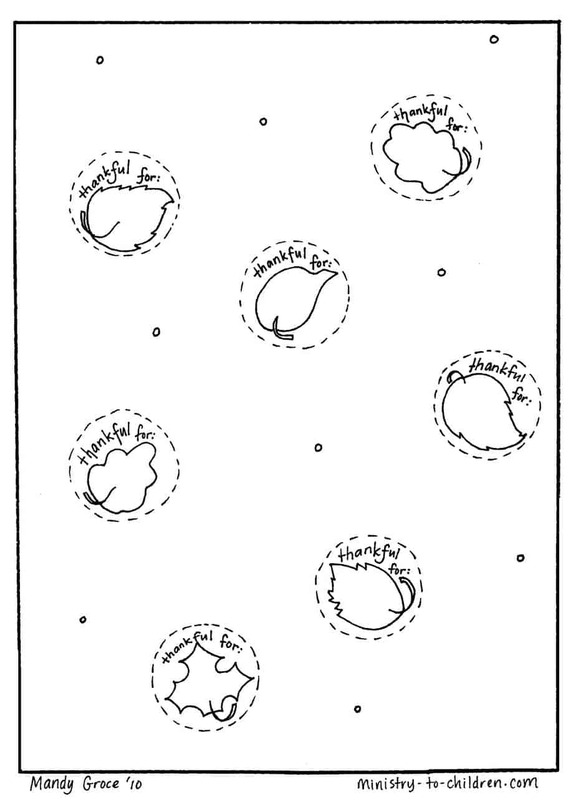 Enjoy these free Thanksgiving coloring pages created by Mandy Groce. It can double as a Thanksgiving craft and learning activity to help children think about specific blessings in their lives. This would be the perfect addition to your Thanksgiving Sunday School lesson. I plan to use it in my children’s church during November. > Download all 5 coloring sheets in one PDF file. Otherwise you can follow the links below to preview them. 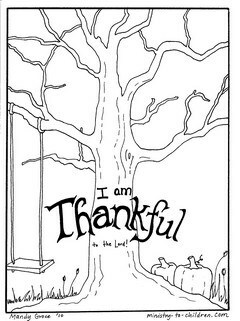 The tree coloring page has the words “I am thankful to the Lord.” It has bare tree branches, pumpkins, and a child’s swing. 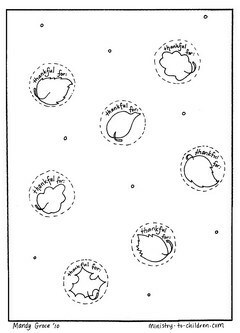 The second page has leaves where children can write in things for which they are thankful. Mandy offered these thoughts about the pages. Be sure to leave her a comment if you want to thank her for this free material. Thank you so much! I will use these for my daughter’s special needs class! We are a very small church, but have about 10 little children on most Sunday mornings. Thank you so much for supplying us with great ideas and work pages!! How generous! Thank you for your giving heart and for using your talents to further the word of God! As for me I’m just thankful! Enjoy many blessings! ??? I love the “I’m Thankful For” tree.